The Fixed Regiment of Louisiana was formally founded by General Alejandro O'Reilly in 1769. Spain came into possession of Louisiana in 1762 when France ceded Louisiana to Spain in the the Treaty of Fontainebleau as compensation for supporting France during the French & Indian War with Britain. In 1768, a plot to oust the Spanish from Louisiana rose to the level of rebellion. As a result, General O'Reilly crossed the Gulf of Mexico from Havana with a force of more than 2,000 men and 12 ships to suppress this French Criollo rebellion. The convoy reached New Orleans on August 18, 1769 where the French flag was lowered and the Spanish flag was raised over the Place d'Armes. O'Reilly announced that Spain was officially taking repossession of Louisiana. On August 20, 1769, General O'Reilly ordered all residents to take an oath of loyalty to King Carlos III of Spain. O'Reilly abolished the Superior Council and replaced it with a Cabildo. He also abolished most French laws and replaced them with a Spanish code. After the rebellion was suppressed, most of the troops that had accompanied O'Reilly returned to Havana. Of those who remained, 213 were from the Aragon and Guadalajara Regiments and were intended to form the battalion in Louisiana. An additional 200 troops from the Lisboa Regiment and 100 foreigner troops comprised of former French colonial soldiers and colony natives joined the Aragon and Guadalajara Regiments creating the backbone of the Fixed Battalion of Spanish Louisiana. By October 1769, the Regiment had achieved the standard Spanish battalion organization of a small HQ, one grenadier company and eight fusilier companies. The Regiment was diverse in population and people of many ethnic backgrounds served, reflecting the diversity of population living in Spanish Louisiana. Other than Spanish, Spanish-American (Criollo) and French men, many Irish, German, Portuguese, Italian, Greek, Sardinian, and even Hungarian were known to have been soldiers of the Regiment. The purpose of the Fixed Regiment was to enlist the local inhabitant's in its own defense. Fixed Regiments, unlike Spanish Peninsular Regiments, did not rotate and remained in colonies where they served. With the quelling of the rebellion and re-establishment of Spain's control of Louisiana, Regiment detachments were now posted. Some were deployed as far away as Illinois and the battalion settled into its duties as a garrison. At the time, no one would have suspected the the Regiment was destined for any engagements other than these routine garrison duties. 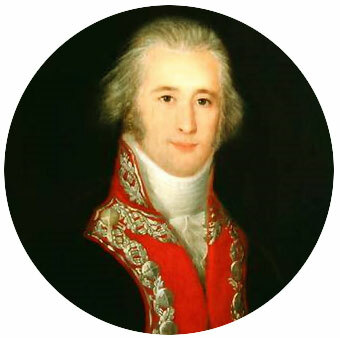 Bernardo de Gálvez, who had taken command of the battalion in 1776, became Governor of the Spanish Louisiana on January 1, 1777. When Gálvez came to office, the British colonies to the north had already declared their independence from England and war had begun. Gálvez's Fixed battalion soldiers, a diverse mix of men including Criollos of color, were spread across the territories. Approximately 100 of the troops were in tiny posts as far away as Baliza, Bayou St. John, Manchac, Arkansas and Illinois, with another 400 concentrated in New Orleans. Gálvez had long wanted to expand the Fixed Battalion and, with perfect timing, later that year he received approval to raise a second battalion. Although Spain never became an official ally of the American rebels, Spain, and King Carlos III, early on provided covert support to General Washington with much needed supplies that included large amounts of money, cloth, uniforms, shoes, food, gunpowder, munitions, cannon, muskets, flints, lead, medicine and other materiel. Gálvez and the Regiment blocked the British from using the port of New Orleans. Control of the Mississippi basin enabled supplies and communications for the American rebel forces to be sent along the Mississippi and Ohio rivers. As the British blockaded the Atlantic Coast, these alternative river systems became a lifeline for General Washington's and George Rogers Clark's forces. Gálvez and his troops saw to it that only Spanish, American and French ships were allowed to use the port of New Orleans. Most of the aid that came to Washington and Clark was received by way of this backdoor system. After Spain formally declared war against Great Britain on June 21, 1779, Spain's King Carlos III commissioned Gálvez to conduct a military campaign against the British along the Gulf Coast in North America. Gálvez and the Fixed Regiment of Spanish Louisiana took to the field and sea distinguishing themselves as they defeated the British in battles at Manchac, Baton Rouge, Natchez, Mobile and Pensacola. The Spanish attack on British forces at Pensacola prevented the British from gathering a stronger army at the siege of Yorktown. 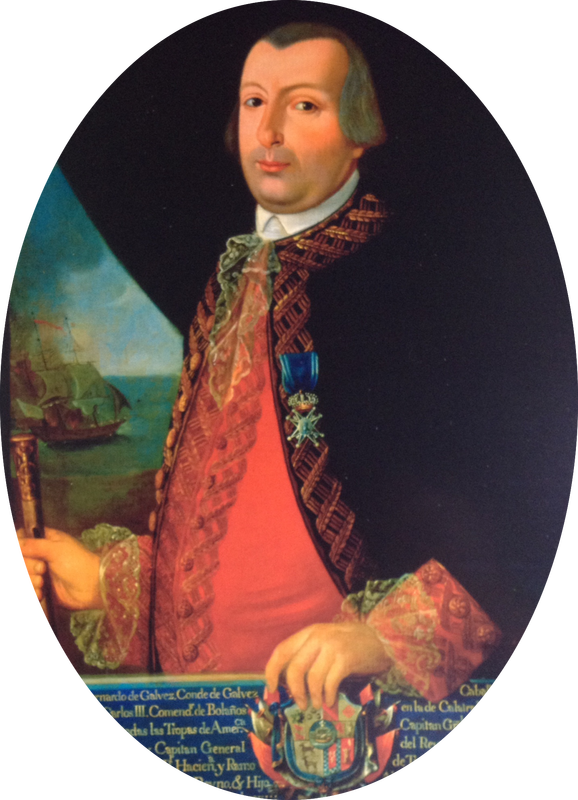 Francisco de Saavedra's freeing of French ships in the Caribbean, his military organization and Spanish money were all pivotal in making it possible for Admiral de Grasse to enter the battle in the Chesapeake at Yorktown with his entire fleet fully manned and armed. In the meantime, the Spanish forces also secured the upper Mississippi and Ohio Rivers by defeating the British at San Luís (St. Louis, Missouri) and San José (St. Joseph, Michigan). They also assisted George Rogers Clark in his battles at Vincennes (Indiana), Kaskaskia (Illinois) and Cahokia (Illinois). In 1782, Spanish forces defeated the British in the Bahamas and gained control of their naval base at New Providence. By opening a third front, the Spanish effectively diluted the British forces that could have been used elsewhere against the American rebels. The 1783 Treaty of Paris granted both east and west Florida back to Spain and a third battalion of the Fixed Regiment of Spanish Louisiana was organized in 1786. This battalion garrisoned Pensacola and its dependencies. In 1800, with the Treaty of San Ildefonso, Spain returned Louisiana to France, which the French then sold to the United States in 1803. With the loss of Louisiana, the Regiment was reduced to one battalion that was stationed in west Florida, mainly at Mobile and Pensacola. After these territories were absorbed into the American Republic in 1813 and 1821, the Fixed Regiment of Spanish Louisiana simply passed out of history. While in service, Galvez's Fixed Regiment of Spanish Louisiana proved to be fierce, dedicated and seemingly unbeatable. "The Spanish Louisiana Regiment, 1769-1803", René Chartrand, Military Illustrated Magazine, April-May 1988.